It’s the Week of Masks, a festival held to chase away evil spirits. But Lailu doesn’t have time to worry about demons. She has bigger fish to fry—or rather, griffons, now that she’s been asked to prepare a mystical feast for the king’s executioner, Lord Elister. Unfortunately Lailu’s meal is overshadowed by the scientists’ latest invention: automatons, human-shaped machines that will respond to their masters’ every order. Most people are excited by the possibilities, but the mechanical men leave Lailu with a bad taste in her mouth. Even worse, the elves still blame the scientists for the attacks on them weeks ago, and Lailu worries that the elves might be cooking up revenge. So when she and her sorta-rival-turned-almost-friend Greg stumble across the body of a scientist, the elves are the prime suspects. 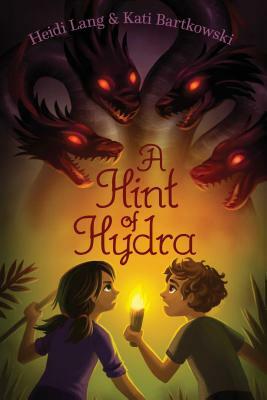 With help from Greg, her best friend Hannah, and the sneaky, winking spy Ryon, Lailu has to discover the truth behind the murder, and soon—because hostilities between the elves and the scientists are about to boil over faster than hydra stew. And just ask any chef: war is bad for business. A Dash of Dragon, by sisters Heidi Lang and Kati Bartkowski, is fast-paced, funny and chock-full of action. Lailu is a brilliant chef, a brave and skilled hunter and a savvy business owner--but she is still very much a 13-year-old, whose curses include "What the spatula?" and, when she's really upset, "Butter knives!" Absolutely charming." "
"A zingy, buoyant adventure where the happy ending is certain but the path to it is enjoyably twisty." "A wildly inventive fantasy with wide appeal." Lang and Bartkowski continue Lailu’s adventures in a world that cooks up magic, fantastical beasts, steampunk science, and a dash of murder mystery in a story that will attract readers who enjoy not only fantasy adventure but cooking TV shows, such as MasterChef Junior."" "Lang’s gripping tale is chock-full of adventure and action." "solving the magical whodunit and battling against steampunk-inspired automatons easily reinforce Lailu’s heroism and allow for an engaging, self-contained adventure."